Shares of Advanced Micro Devices (NASDAQ:AMD) will report earnings after the close on Tuesday. That comes after Nvidia (NASDAQ:NVDA) pre-announced worse-than-expected preliminary guidance on Monday. It crushed that stock by more than 14% and dragged AMD stock down by about 7%. Did AMD suffer the same fate that Nvidia did during the quarter? Last quarter, waning demand from cryptocurrency miners hurt Nvidia and AMD. This time, Nvidia says lower demand out of China was a drag on its sales and gross margins. While Advanced Micro Devices stock does not have as much exposure to China as Nvidia, it certainly is on the list. That may not bode well for AMD stock when the company reports its fourth-quarter results after the bell today, particularly if the company misses expectations and provides poor guidance. Analysts are looking for earnings of 8 cents per share, down just a penny per share from 90 days ago. Investor expectations likely came down after the stock took a hit on Monday, but still, there’s reason to worry after Nvidia’s warning just a day earlier. This is where things get tricky with a name like AMD. Because the stock has come down so much in such a short period of time, it’s investors’ way of pricing in bad news. The only question is, did they price in too much, not enough or just the right amount? Unfortunately, we won’t really know until after the numbers come out. Had Advanced Micro Devices stock barely wavered ahead of the report amid Nvidia’s warning, I think we could be headed for a serious haircut. Now, AMD has come down so much, it’s possible that we get a rally off the report, particularly if its fourth-quarter results are not as bad as expected. So how do we trade this thing? There’s a difference between holding an investment through earnings and trading through earnings. I don’t mind the former and don’t prefer the latter. It’s very difficult to know — based on the headline results — what a stock will do. Like most setups, I’d rather trade the reaction than guess it ahead of time. For that, we need levels. AMD stock was definitely caught up in some nasty selling, but was able to put in a double bottom at $16. After, shares were able to push through downtrend resistance and have been trending higher — albeit slowly — for most of this month. That uptrend, which actually touches back all the way to November, is now wavering. 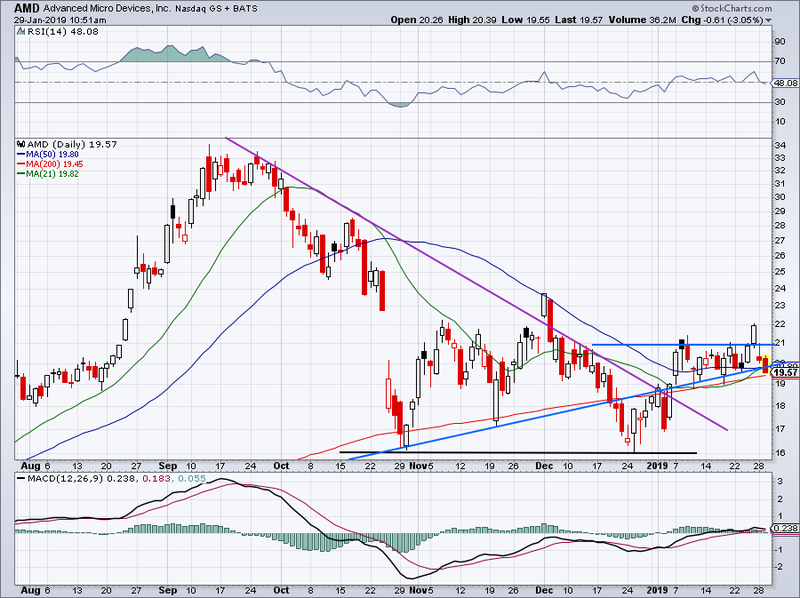 AMD shares are just below uptrend support and teetering near the 200-day. If it loses this mark, it will be below uptrend support as well as all of its moving averages. On the flip side, this trend higher has found resistance near $21 to $22. Those are the levels to watch: $19 on the downside and $21 on the upside. What happens if AMD stock is above or below those marks? A close below $19 puts AMD in no man’s land and sets up a possible retest of the $16 lows. A close above $21 puts a breakout potential back on the table and a move to $23 and potentially higher is possible. I don’t know what will happen to AMD stock and I don’t particularly care. I just want to see how the stock trades after it reports. These levels may not matter, but it won’t hurt to keep them handy. The post Key Levels to Know for AMD Stock Earnings appeared first on InvestorPlace.